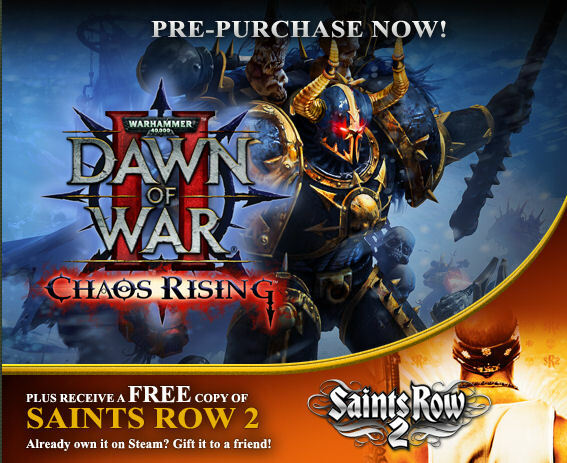 Dawn of War 2: Chaos Rising is only 23 short days away, but if you need to pass the time while waiting for the expansion pack to last year's awesome 2 player co-op RTS, perhaps Saint's Row 2 will fit the bill? After all, it's a co-op game as well! Steam has put up a preorder incentive with just such a deal, allowing you to purchase Chaos Rising for $29.99 and receive Saint's Row 2 free. Page created in 0.3263 seconds.